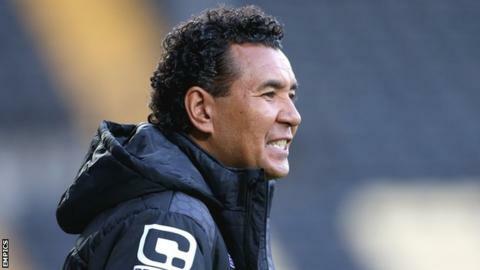 Notts County manager Ricardo Moniz says he wants the club to take the Johnstone's Paint Trophy seriously with a Wembley final an enticing attraction. The Magpies travel to Sheffield United in the second round on Tuesday after beating Mansfield Town in round one. Moniz told BBC Radio Nottingham: "It is a unique competition, the final is at Wembley and we have ambition. "Notts County have to win things and as long as I am coach, we have to win as much as possible." The Magpies booked their second-round place with a 3-1 victory over the Stags. Moniz continued: "We don't do concessions in any cup. We must be proud of this cup and every game - I am proud. "I look forward to it. It's unique for just League One and League Two clubs."